We were hungry that night, the night my girlfriend and I met for dinner at Skovorodka in Brighton Beach. There was a large birthday party happening in the back room, and our server seemed almost too preoccupied to take our order. We got his attention, though, by ordering a metric ton of food. We started with the spring salad, a mound of radishes and cucumbers with scallions and egg in a sour cream dressing, plus an enormous plate of pickles. Cucumbers and cabbage, yes, but also triangles of pickled watermelon and a large pickled tomato, along with some slices of dense bread. 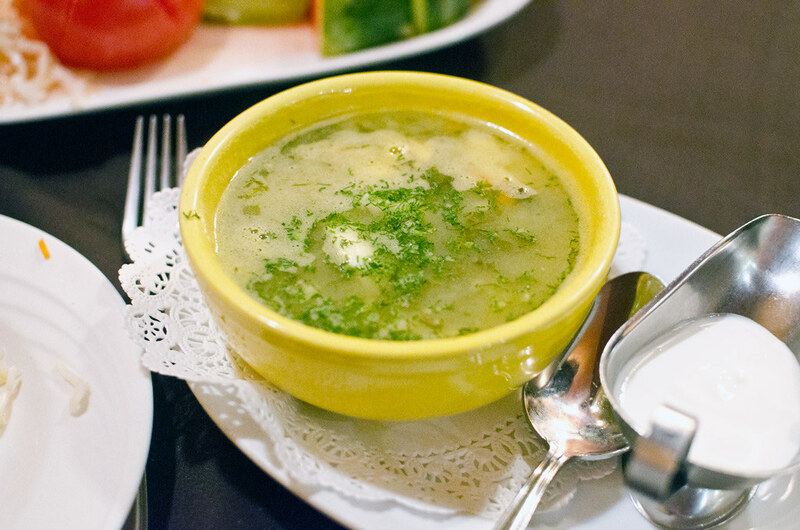 We spent some time alone with this food before they brought out the soup — mushroom for her, green borscht (with more egg) for me, each with a small tureen of sour cream on the side. Next came a plate of vareniki filled with potato puree, the small dumplings slathered in caramelized onions and served with yet another small boat of sour cream. We barely had time to tuck into these when they brought out the mushroom Julien — mushrooms cooked in cream sauce and baked with a thick layer of salty cheese on top. It was all so good that we managed to finish most of it while a live band sang to the revelers behind us, and we vowed to have own birthday parties there in the future. This entry was posted in brighton beach and tagged borscht, brighton beach, russian, skovorodka, ukrainian. Bookmark the permalink.